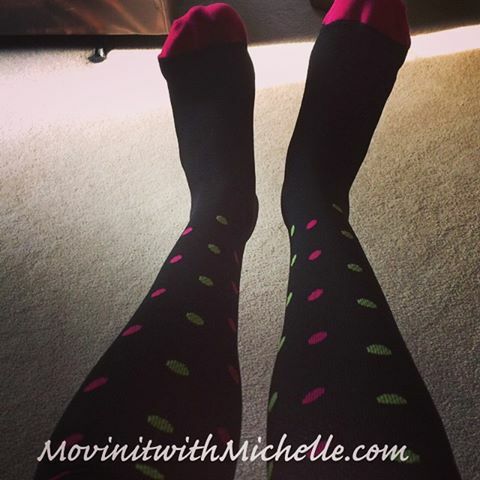 Running long, cooking slow, and Lily Trotter sock review! As most of you know, I had 19 miles on deck this weekend for my week 13 of marathon training. While I normally prefer to run my short runs by myself, the thought of running 19 miles solo was not giving me peace of mind. Add in the forecast of 50-60% chance of thunderstorms and you could say I was nearly dreading the miles. I didn’t sleep hardly a wink Friday night, but had my rain poncho and gear all set. I woke up at 4:30 a.m. and was out the door by 5:15. The first few miles were VERY wet, and I was thankful for my poncho despite it’s lack of comfort. If you read my mini recap on my FB page, you saw that I accidentally ‘dismissed’ my first 3 miles of running when I ‘paused’ to take off my poncho. Damn. Thankfully I knew were I was and had just looked down at my watch. Here we go with more runner’s brain math, ack, lol. 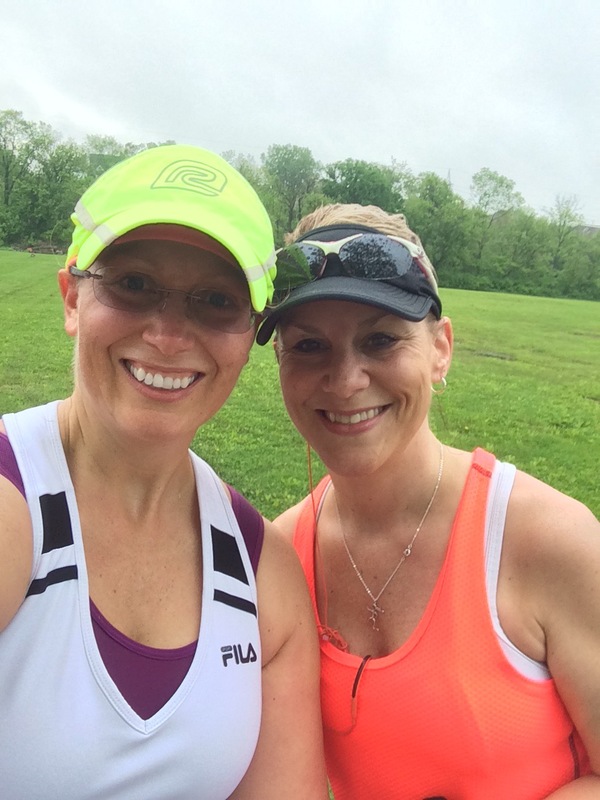 I was lucky enough to run into my friend Melissa around mile14! The miles ticked by, and something happened out there that even surprised ME. 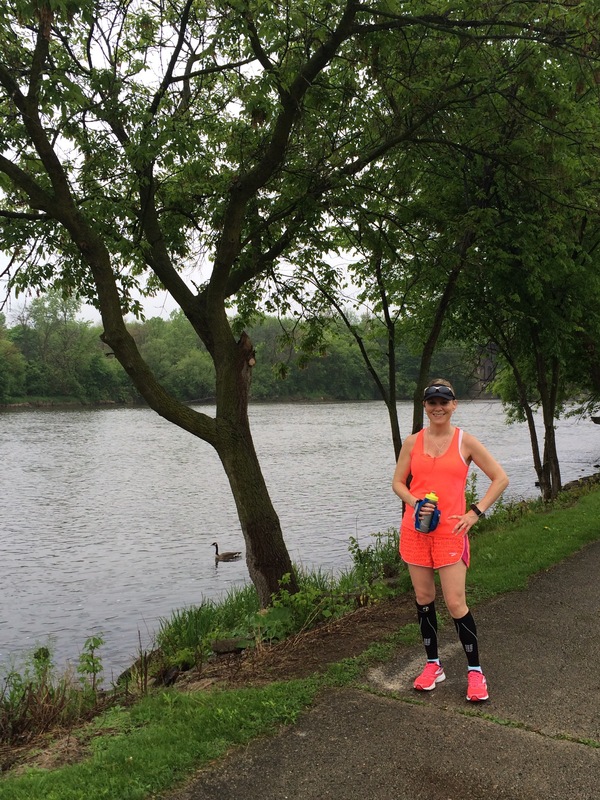 I was…HAVING FUN out there, running between raindrops, enjoying the trails, and listening to music. I COULD run solo, no matter the mileage, and this made me smile. It was liberating to be out there on my own, with claps of lightening in the distance to cheer me on. And even when it started to POUR cats and dogs, I smiled. I took cover briefly to fuel, but when I realized it wasn’t letting up I continued on for a good 3 miles in some pretty hard rain. And I do believe, I was smiling from what I’m told from friends who saw me out on the trails that morning. I felt/feel nearly renewed. My legs hurt, my knee ached, and my ITB yelled at me the last few miles, but nothing was going to bring me down. YAY for a good long run. 1. They were very easy to put on, unlike some other compression wear that you have to tug and pull to get on. 2. The colors were really fun, and I loved the polka dot print. 3. They were SOOO comfy, and I actually slept in them last night and woke up with happy legs. All in all, I loved them and will use them in the future. I am particular with my socks, but am hoping they will make sleeves too so I can run in them as well. In my attempt to eat healthier and lose 10 lbs. I decided to make crock pot pork carnitas for dinner so I would have yummy left overs for lunches this week. Drizzle the roast with extra virgin olive oil, and liberally apply the rub. Place in your crock pot with the fat cap up, and add your onions, garlic, and peppers. Drizzle over the juice of the oranges and limes, and cook on high for 4-6 hours, or low for 6-8 hours. Remove the pork, and let it rest for 10-15 minutes. Pull apart with two forks, and place in a bowl. Drain the liquid from the crock pot, and add the strained liquid back in to the pork to keep it nice and juicy!! I served it over a salad of mixed greens with black beans, corn, and avocado. No dressing needed, just drizzle a bit of the drained juice over the top! Lb.’s lost-NONE…but I blame it on girlie crap this week. Did you run long or race this weekend? 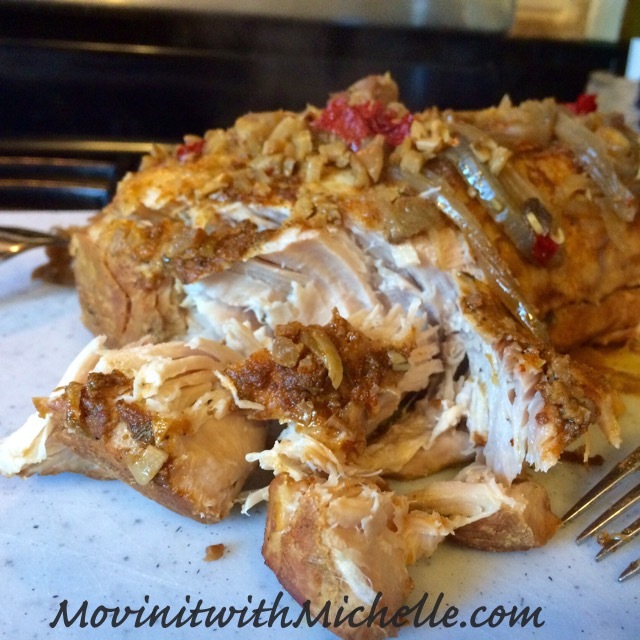 Have any good crock pot recipes you love? The food you indicated – just healthy! Sure will! This is my 3rd full marathon so I am pretty prepared so far. wow – I did Chicago, New Orleans, Indianapolis and San Diego…I can’t wait to hear from you! Hehe I was trying be subtle but know the ladies will get it. Holy bloating Batman. My favorite alone time was running long distances along the trails.- just me and my thoughts. It’s pretty amazing! Now that I converted the hubby into a runner I don’t go solo as often but do love it when I do. Sounds like you had a great time. Enjoy training and good luck! 19 miles in the rain?! You rock! I probably would have bailed, awesome job sticking to it! Thanks, Fallon!!! I tried to come up with every excuse I could to stay in bed, but made myself get up, LOL! That’s awesome your hubby helps with your miles!!!! Thanks! It was tough, but I remembered back to my 20 miler in 2013 where it was torrential downpour and it made this not seem so bad, LOL! Hooray for a good long run! A confidence builder for sure. That rain was ridiculous. I love my Lily Trotters too. Such a fun print. Thanks so much!!! I agree, the prints on the trotters are too cute! Great job on your long run!! Even better than just getting it done is that you had fun! Amen!!! I was so glad it turned out this way! Thanks, Molly! 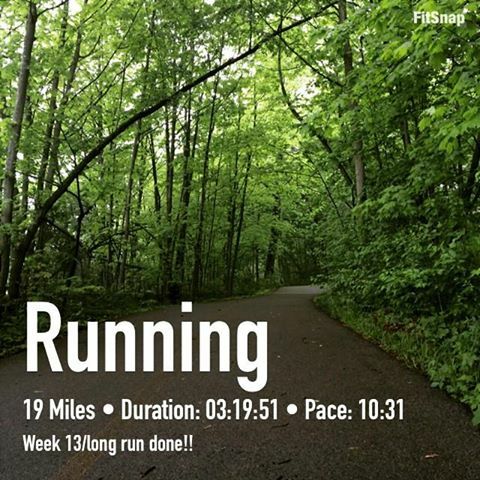 I find running alone therapeutic….but can’t imagine running 19 miles! Very cool! I agree about the therapeutic benefits of running solo…but yes, 19 miles was a doozy to do alone!! LOL! Nice job on your solo 19 miler! I usually rely on a group to push me. I know I can do the distance solo but I usually hold a faster pace with a group. I’ve been having a lot of success over the past two months running solo and pushing myself. I’ve taken pride in that same thing lately. 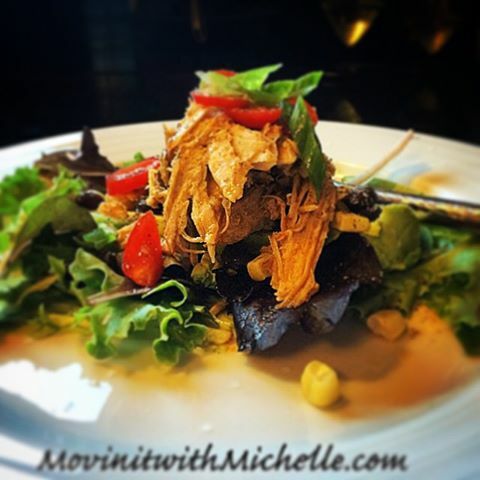 I have a bunch of good shredded meat type crock pot meals and I usually serve them on a salad, cauliflower “fried rice”, or on a homemade paleo “wrap” (I don’t do gluten on a regular basis!). I’ll have to try your pork! Thanks!!!! I have been trying to cut out gluten as well for the most part. It seems to help my tummy issues! Congrats on the 19 miler! I love your super bright clothes on a gloomy day! I think it helps! I agree!!!! I think I was the brightest person out there that day, LOL!!! Wow, sounds like you had an amazing long run out in the rain! It’s hard to not let the wet weather put a damper on things so that’s really impressive 🙂 It’s nice that you ran into a friend on the way. Thanks!!! I think the running Gods knew I needed a pick me up and had me run in to Melissa just at the right time!!!! Thanks again! Love the socks! Nice work on the run! That wasn’t a good long run – it was a great one! HA! I’ll have to agree with you on that one, Char! Thanks!!!!! Yay for a long solo run! Those are some of my favorites! And the rain can be refreshing! I am happy it wasn’t accompanied by thunder and lightening!